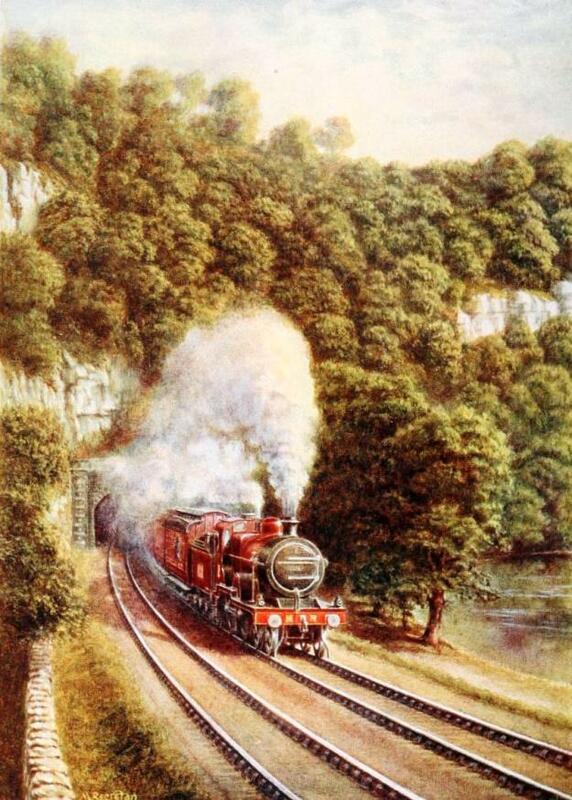 OF the three trunk roads which connect London with Scotland the story of none, perhaps, is so fascinating as that which is known to-day as the Midland Railway. Its birth was humble; for years it confined its operations to the development of the country immediately contiguous to the scene of its origin; it became associated with one of the most notorious figures in the history of high and frenzied finance and railway aggrandisement, and finally emerged into one of the most progressive and prosperous railways of the world. In the early days of the nineteenth century the coalfields of Leicestershire were sorely handicapped by the absence of cheap and expeditious transportation facilities. True there was the Charnwood Forest Canal, extending to the county city, but it was an uncertain highway. ln winter movement was held up by frost and ice, and when the waterway finally burst things were reduced to a critical condition. The city suffered severely from the dearth of fuel, but its loss was trivial in comparison with that of the collieries, which were deprived of their ways and means of disposing of their produce. It is an ill wind which blows nobody good. Leicestershire’s disaster was the opportunity for the rival coal producing country of Derbyshire and Nottingham. The collieries in the latter county did not let slip the chance to forge ahead, to the detriment of the Leicestershire fields. This state of affairs became so intolerable that one or two prominent figures in the Leicestershire colliery industry conceived a bold master-stroke, One. William Stenson, was particularly enterprising and aggressive, He had watched the progress of George Stephenson’s invention, and had followed the building of the Liverpool and Manchester Railway with the liveliest interest. If a steelway could benefit the two great cities of Lancashire, surely it would prove equally useful to the Leicester-shire coal districts. Why not lay down a railway for the transportation of the fuel to the nearest and most remunerative market? To him there was no valid reason why it should not be done. But fearing that such a suggestion might be scouted as wildly impracticable by ignorant and prejudiced interests, he decided to investigate the question personally and unaided, so as to fortify himself with facts, figures, and unassailable arguments when the moment, arrived for its discussion. Armed with a level he made a hurried run through the country between Swannington and Leicester, and this rough survey con-vinced him more than ever that his idea was perfectly feasible. He thereupon unfolded his proposals to a kindred spirit, Mr. John Ellis, who at once saw eye to eye with the scheme, and in order to secure the very highest possible recommendation in its favour he communicated with George Stephenson, who at that time was wrestling with the problems involved in the building of the Lancashire Railway. Stephenson’s services at that time were in urgent request the whole world over, and so he declined to become associated with the Leicestershire project. But Ellis was not to be thwarted. He invited the Father of Railways to a bumping dinner, which proved so satisfactory that the eminent inventor was induced to reconsider his refusal. He promised to go over the country with Stenson’s surveys so as to become acquainted with the situation at close quarters. He did so, and reported so favourably upon the project, that he even undertook to raise the money to defray the cost of construction if necessary. 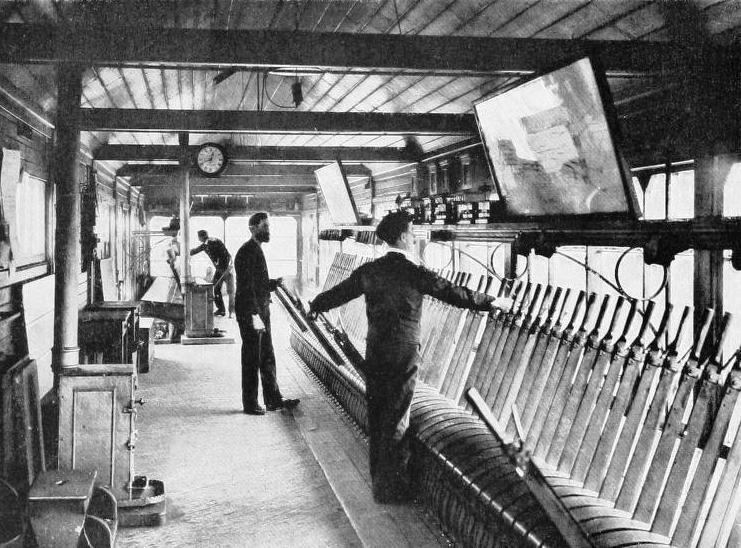 As, however, his hands were so full with other plans for railway conquest he pointed out that he could not supervise construction, but strongly recommended that his son, Robert, who had been called home from South America, should be appointed engineer-in-chief, since the Manchester and Liverpool Railway was practically completed. 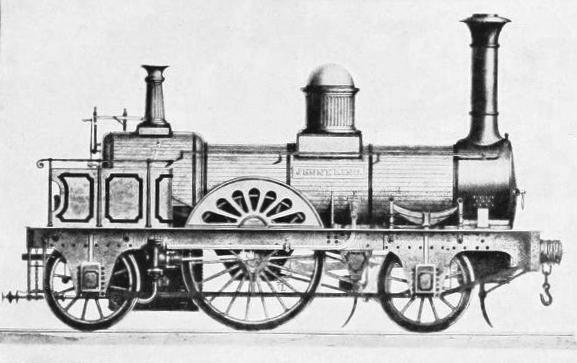 An early type of the single driver locomotive. Parliamentary sanction for the construction of the Leicester and Swannington Railway, as it was called, was extended in 1830. It was not a big enterprise as railways go, being only sixteen miles in length, but it involved some problems which in those days were by no means so simple to solve as now. The Glenfield Tunnel tripped up the contractors badly. It is perfectly straight, level, and 1,796 yards in length, but it extends through running sand. Boring for a single line of standard gauge was comm-enced from either side of the hill to be pierced, as well as in both directions from the bottom of four intermediate shafts. Keeping the sand back became the supreme difficulty, involving heavy timbering in advance of the brickwork lining. Even then progress was so slow that finally the contractors threw up the job in disgust, and retired from the scene broken in finance. The troubles experienced in connection with the Glenfield Tunnel having been noised far and wide, no one could be tempted to essay the task, so the railway company was forced to complete it by direct labour. The opening of this short line solved the coal transportation problem for Leicestershire very effectively, but to the dis-advantage of the Nottingham coal interests. The latter thereupon embarked upon a comprehensive scheme of retaliation. But its proposal did not emerge from Parliamentary investigation without bearing sad evidences of the ordeal. The fathers of this scheme, the “Midland Counties”, found out very quickly that it is very easy to tread heavily upon the toes of others in railway matters, and so encountered such relentless opposition that the dreams of railway conquest had to undergo modification. However, the foundations of the future prosperity of Derby as a railway centre were laid by linking it with Leicestershire in 1840, as well as throwing out spurs to Rugby and Nottingham. Another system was the Birmingham and Derby, carried out between these two points by George Stephenson, while the “North Midland” was projected by the same engineer to provide a railway route between Derby and Leeds. In this work Stephenson had a pretty stiff tussle with the treacherous shale when driving the Ambergate Tunnel. The completion of the “North Midland” and the “Derby and Birmingham” lines precipitated a result which was somewhat common in the early railway days, when roads were run to competitive points, and which, while beneficial to the travelling public, affected the shareholders somewhat adversely. Both lines were able to give and take traffic from the London and North Western Railway as it is now. Both fought hard for this business. The competition produced a rate war, with fares and tariffs cut mercilessly. This condition of affairs prevailed until at last, additional competition being threatened from new construction, the rivals awoke to the fact that if further lines were completed the traffic would be divided still more, and they decided that it was better to combine forces. Accordingly a permanent peace was secured in an effective manner - the opposing factions amalgamated and blossomed forth as “The Midland Railway”, with a combined mileage of 181½ miles, on May 10th, 1844. Then the railway speculating mania broke out with fearful virulence. With it was associated the man who had undertaken the chairmanship of the amalgamated concerns - George Hudson. From his astute tactics, many of which were of a doubtful character, he became the first Railway King, the Harriman of the Forties. He secured control over 1,000 miles of lines, and was dictator of as many new projects as he cared to take under his wing. Rut the inevitable happened. The common sense of the public returned just as suddenly as it had disappeared. Visions of castles built out of railway plunging were shattered like glass. With the reawakening of discretion Hudson’s power vanished, His fall was as complete and as dramatic as had been his rise. Some of his dealings when investigated dispassionately savoured of the fraudulent; shareholders accused him of double-dealing and working against their interests, which he ought to have protected, Blocks of shares were missing; and accusations of having bribed Members of Parliament heavily in order to force his dubious schemes to success were bandied on all sides. Although Hudson was assailed when the railway bubble was pricked, in reality he established tin Midland Railway. He had embarked upon a wholesale policy of expansion and absorption, and the outcome was that the system of which he con-trolled the destinies secured a firm grip upon the Midland counties. Lines were run in all directions, so that within a short time Derby became the hub of a great railway network, radiating in all directions, and tapping every important city, town, village and hamlet in the centre of England. On the west it reached out as far as Bristol. Where it could not construct, or a line was already in possession, either acquisition, leasing, or working agreements were drawn up. Odds and ends of every description were bought, and by being knit together were turned from useless into valuable properties. Growing rapidly and prospering immensely, it was not surprising that some curious situations were provoked at times. For instance, the Midland cast covetous eyes upon Manchester. There were two lengths of line lying between Ambergate and “Cottonopolis” which would offer the very means of access to the desired city. Overtures for the acquisition of these two stretches of road were made, but, when all was ready for signing the compact, the London and North Western, having heard of the move, stepped in, offered better terms, and forthwith secured the links, to the discomfiture of its rival. 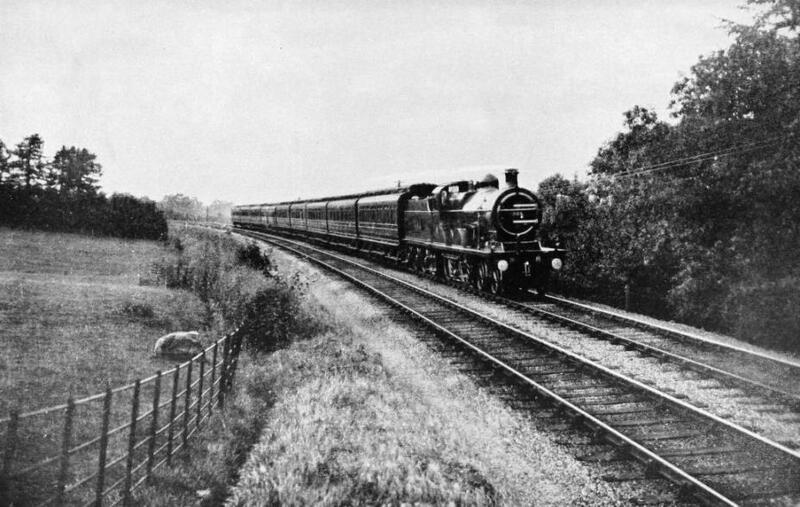 Foiled in this attempt, the Midland determined more than ever to reach out to Manchester; it would build its own line. Natur-ally the project was fought tooth and nail by the London and North Western Railway. There was a short, merry fight in Parliament, but the grim pertinacity of the Midland won. It received permission to extend its line from Matlock to a station known as New Mills on the Manchester, Sheffield, and Lincolnshire now known as the Great Central Railway - over whose metals it was thence able to run into Cottonopolis, and ultimately gave it a means of penetrating to Liverpool. In forging this link the engineers had to traverse the bleak Peak district, making a tedious climb to a level of 985 feet to reach the summit. This is the country of the dales, and at places the work was heavy and expensive. The driving of the Dove Holes Tunnel, 8,580 feet, was the most trying task. Although extending through limestone, straightforward work was hampered by subterranean streams, which occasioned many anxious moments. On this section, too. a heavy landslide provoked a serious situation. 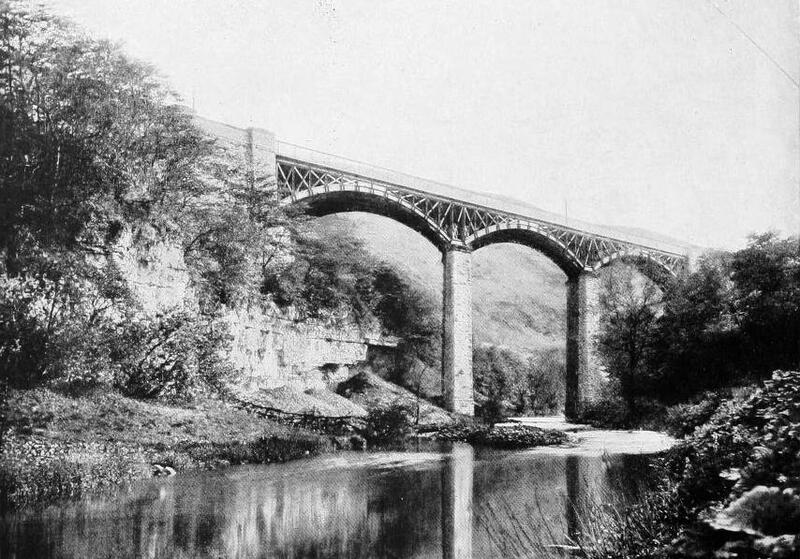 A lofty viaduct had been completed in brick, but the movement played such havoc with the work that it had to be demolished, and a temporary wooden structure run up. The first vehicle was built at Pullman City (USA), shipped in sections to Derby, and there re-erected. The Midland, however, suffered most severely in regard to its traffic to and from the South. Rugby was its outpost on the London side. Difficulties, and here all the business was turned over to, or taken from, the London and North Western Rail-way. A very good idea of the extent of the volume of this business may be gathered from the fact that by the year 1862 the annual amount paid over to the rival in respect of this traffic was no less than £193,000. Seeing that the two were competing for business in a common territory, it is not surprising that the London and North Western strove to cripple its former competitor in this direction, and spared no effort to consummate its own ends. The Midland Railway realised fully its peculiar position, and so decided to secure competition for its southern business. In 1862 it sought powers to build a new line from Leicester, through Kettering and Bedford, to Hitchin, where it could effect a junction with the Great Northern Railway. This offered a shorter haul over a “foreign” line as compared with Rugby, and the London and North Western, recognising that a profitable source of revenue was threatened, fought the project tenaciously, but the promoters had too strong a case, and so won the day hands down. Then a lively bid for Midland business ensued between the Great Northern and the London and North Western Railways, to the benefit of the third party, which now secured a far better service in regard to this class of business than ever had been the case before. It played one line against the other very effectively, but the Great Northern held the stronger position, as the proportion of revenue which had to be paid out by the Midland in this instance was smaller than via Rugby, owing to the shorter haul. In fact the Midland gave the Great Northern Railway so much traffic that the latter line became choked with it. During the course of one year no fewer than 3,100 trains were held up between Hitchin and King’s Cross, the London terminus of the Great Northern, and this despite the fact that the latter line spent over £60,000 in improvements in anticipation of the greater volume of business which it realised must come when the Midland reached Hitchin. Under such circumstances surprising that the Midland decided that it had better carry its own metals into London, and so reap the full benefits of the traffic. This proposal met with strenuous opposition from the lines already in possession, but here again the case presented was far too overwhelming to enable the opposition to break it down. The Midland proposed, not to proceed southwards from Hitchin, as might have been supposed, but from Bedford through Luton, St. Albans, and Hendon to the metropolis, and this proposal met with approval. Although these engines were decried by the British critics they earned their cost in the course of the first year’s service. The site for the London terminus was the most searching problem in this move. Coming in from the North the line had little scope. A unique opportunity was afforded to build a huge union terminal in the metropolis, similar to those abroad, for the housing of the three lines entering London from the North, but the inter-jealousy was too keen to permit the varied and antagonistic interests to recognise the wisdom of such a departure, for those were the days when the advantages of pooling were not appreciated; when railways preferred to fight one another instead of pulling together. Force of circum-stance compelled the system to pitch upon a site between the termini of the lines in possession, and accordingly a huge slum area, known as Somers Town, in the purlieus of King’s Cross, was swept out of existence to make way for the new station. In approaching the metropolis the railway was balked by one obstacle. This was the Regent’s Canal, which ran roughly at right angles to the proposed location. The waterway could not be diverted, so the Company was faced with the task either of burrowing beneath or spanning the obstacle. The former would have necessitated placing the terminal underground with a steep approach. Bridging demanded that the platform area should be elevated so as to maintain the gradient. The company decided that the latter was the more satisfactory way out of the difficulty, and it was induced to such a decision by an economic circumstance. The Midland Railway taps Burton-on-Trent, the world-famous brewing centre. The beer traffic to the metropolis was certain to attain huge proportions, and the company would be faced with the task of providing storage for this commodity in London. Why not utilise the basement area of the terminus as a beer store? The suggestion was found eminently practicable, and forthwith was adopted, the engineers being urged to make the utmost, of the storing capacity below the platform area. The latter did so, adopting iron pillars in preference to brick arches for the support of the superstructure, because iron occupied less space. As it has been ingenuously declared, “the planning of the track level was governed entirely by the number of beer barrels which could be accommodated beneath it.” The station itself is one of the most attractive in the world, while its huge and graceful single arched span roof compels technical attention. The arch has a clear span of 243 feet at ground level, and rises to a height of 100 feet above the metals, while the roof is 690 feet in length. In this manner an area of 4½ acres are enclosed, sufficient for housing 10 roads serving 7 platforms 800 feet in length. It was a daring proposal when outlined by Mr. W. H. Barlow, the consulting engineer to the company, inasmuch as it represented the largest work of its kind ever attempted in railway engineering up to that time, and never has been excelled, at least not in these islands. The south end of the station is flanked by a noble hotel, which is a good representation of Gothic architecture, and which in itself constitutes one of the most imposing and palatial buildings in the metropolis. By 1868 the first Midland express left St. Pancras for the North, therein ushering in the Midland’s direct touch with the metropolis. But the system did not cease its aggressive tactics. Another valuable field awaited exploitation. The traffic of the Midland ramifies to all points of the compass, and the company found that this business was growing rapidly in one particular direction - northwards to Scotland. It had no means of coping therewith, as it did not possess any direct communication with the Border. Therefore it would make one. This, however, was easier said than done, because the Pennine Chain, running southwards from the Border like a backbone, stood directly in its way, and offered some of the roughest country which an engineer could wish to traverse - where construction was certain to be expensive and tedious. It succeeded in getting as far north as Settle, where the business had to be handed over to the London and North Western. Of course, inconveniences and disadvantages similar to those which had been experienced years before in regard to the London traffic were encountered. 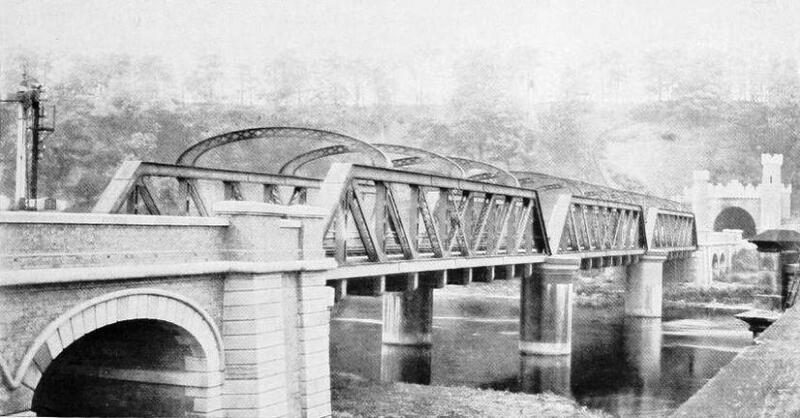 An independent line to Carlisle was imperative, so in 1866 a Bill was presented to Parliament seeking permission to bridge the 71¼ miles between Settle and the Border city. Once more strenuous opposition was offered by the line in possession, but once again it proved unavailing. 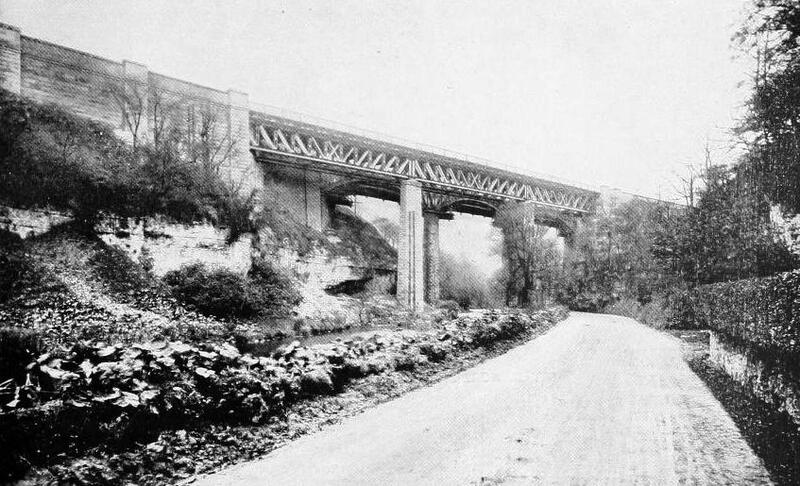 The work on this stretch proved to be among the most difficult experienced in British railway engineering. Ragged crests demanding tunnelling alternated with deep rifts which had to be spanned, and progress was both slow and expensive. Con-struction came out at over £42,000 per mile, which, although high in comparison with the average of £10,000 to £12,000 per mile in other countries, was about the average prevailing in these islands, so was not so exorbitant as it appears at first sight. The engineers followed the easiest course that was open to them. Leaving Settle they clung to the Ribble Valley - crossing and re-crossing the winding stream so as to preserve the alignment and grade - to lngleborough. Here the Batty Moss offered a serious obstruction, but the plotters overcame it by means of a viaduct, 1,328 feet in length by 105 feet above the foundations, to gain the opposite side of the depression. Then they had to tunnel for some 2,640 yards 500 feel below Blea Moor. After leaving Settle the plotters were forced, from the configuration of the country, to give an upward pull for 16¼ miles to Dent station, which is the summit level - 1,145 feet above sea-level - of the Midland Railway. Beyond the summit comes another burrow, the Ruse Hill Tunnel, 1,205 feet long, while 5 miles beyond Hawes Junction, the alignment ran across Aisgill Moor, leading to the borders of Westmorland. Tunnel and viaduct in rapid succession were found unavoidable to reach Kirkby Stephen and Appleby, while some of the cuttings through the spurs attained impressive proportions. While the route extends through rugged country it offers magnificent vistas of the loftiest crests in England, so that the Midland Railway well deserves its colloquial title of “the most picturesque route to Scotland”. By the time the railway builders had bonded Settle to Carlisle over £3.000,000 had been expended. The line was opened fur goods traffic on August 1st, 1875, while nine months later it was available for passengers. From the railway’s point of view the connection was worth every penny which had been laid out. Directly it secured an independent line to the Border city, where a junction was effected with the Scottish trunk roads, its business increased by leaps and bounds. From Bath, its western outpost, to the Scottish border the trains have a clear run of 320 miles, while a continuous line of 308 miles is offered from London to the North. In co-operation with the London and South Western Railway an entrance was also obtained to Bournemouth, a joint line stretching from the pine tree resort to Bristol. But the activity of the Midland has not been confined by any means to the penetration of new territory. The revolutions it has effected in regard to railway operation are equally noteworthy. It was the first to introduce the luxurious Pullman car into this country. Mr (afterwards Sir) James Allport decided to make a bold bid for the London traffic, and thought that the railway coach which had proved so immensely popular in the United States would score an equal success here. Accordingly he ordered a drawing-room car from the American Pullman works. It was shipped over in sections and re-erected at Derby. A small charge over the first class fare was levied for the right to use this vehicle, this excess being handed over to the Pullman Company. Strange to say, British conservatism shunned the new idea; the travelling public had become so wedded to the small compartment and its relative privacy that il would have nothing to do with the saloon carriage. However, the general manager, confident that his move was correct, stuck to his experiment. Slowly but surely the prejudice against new-fangled ideas was broken down, and within a few years the Pullman car became an indispensable unit of the Midland long-distance trains. Gratified with this success, Mr. Allport decided upon another bold stroke. The introduction of the Pullman car had created virtually four fares, as compared with a scale of three upon other systems. To bring the railway which he controlled into line with the other roads he abolished the second class fare. The move was criticised severely, but it proved peculiarly success-ful, because the general appointments of the third class vehicle were raised to the prevailing standard of the second class coaches upon other lines. The result was that the passengers favouring this type of accommodation preferred the Midland way to the North. The rival systems endeavoured to retain their business by reducing the second class fare to a small fraction in excess of the cheapest means of travel. It succeeded to a certain degree for a time, but the fact that the controller of the Midland destinies was more far-sighted than his contemporaries is evidenced to-day, because the second class coach is being rapidly eliminated from modern railway operation. It must also be remembered that the Midland Railway first introduced the popular cheap excursion, and incidentally laid the foundations of the largest tourist travelling business in the world. An energetic citizen of Leicester, Mr. Thomas Cook, realised the fact that if only travel were made more attractive large numbers of people would take advantage of the opportunity, in the same degree that ladies will always flock to a bargain sale. So he approached the secretary of the Midland Counties Railway in 1841 with t he idea of running a special train from Leicester to Loughborough at a cheap fare on the occasion of a temperance congress. Accordingly, on July 5th, 1841, was run the first excursion in railway history, the chance to make the 23 miles round trip for only one shilling proving so irresistible that 570 people took advantage of it. The growth of traffic demanded a second viaduct, which was built beside the original structure. The Midland Railway never has departed from its pushing and aggressive policy. Determined to participate in the remun-erative Irish trade, it established a new port at Heysham, created its own fleet of steamers, and inaugurated a mail route between London and Belfast. Recently powerful evidences of its activity have been afforded by its acquisition of the London, Tilbury, and Southend Railway, which not only carries its operations into the southeast corner of England, but provides it with a strong hold upon the Thames maritime business. To-day the ramifications of the system extend to all corners of England, embracing 1,744 miles of line, and this vast network has been spun from the short length of 16 miles laid between the collieries of Swannington and Leicester city which was opened on July 17th, 1832. 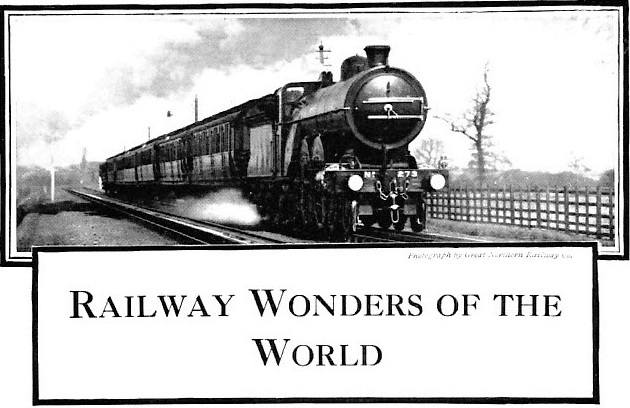 You can read more on “Britain’s Inland System”, “The Midland Scotsman” and “The Story of the LMS” on this website.